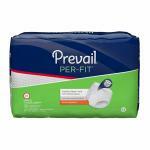 Prevail Super Absorbent Underpads provide maximum comfort and protection. They are soft, absorbent and durable even when wet. Features include: 1) Super Absorbent Layer to quickly pull and lock up liquid, and 2) Moisture Proof Barrier for effective protection of beds, linens, chairs and other surfaces.